Losing weight can become a difficult task for once for all for many reasons. Although no one can deny the fact that imperative to follow a balanced diet can help to lose weight quite easily. On the journey to the weight loss consuming detox drinks can be the most effective part of it. The reasons that detox drinks can be successful as it promotes proper digestion in the body. It is said that a good digestive system is essential for healthy weight loss. The reason that good digestion helps to flush out toxins from the body which are gathers in the form of fats and often settles into the body. There are many herbal teas for weight loss that can be trusted and be an ally to fight against obesity successfully. What are the drinks that can lose belly fat? There are several ayurvedic teas that can easily be made at home. 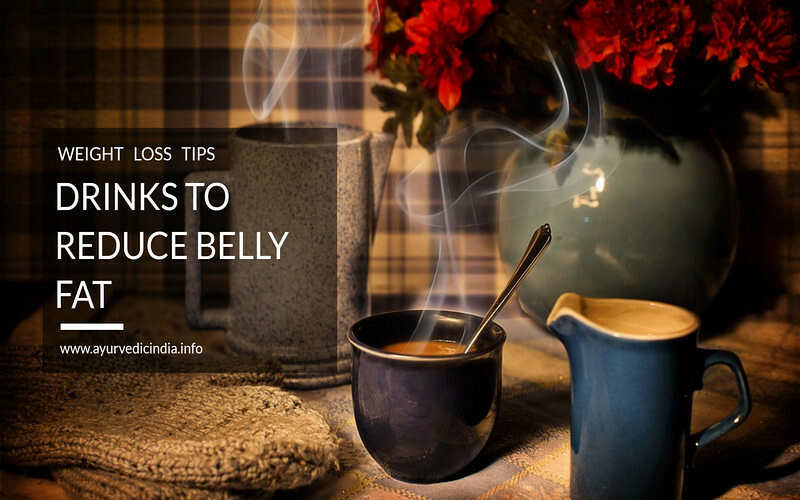 Consuming these teas can help to reduce belly fat by promoting digestion and lowering bloating. Some of the teas such as rose tea, green tea, cayenne pepper tea, dandelion’s tea, turmeric tea, ginger tea, black pepper teas are the top choices for people who want to make flat their stomach using all natural herbal teas. Below are some of the Best Tea for Weight Loss and also good for losing belly fat. When you hear word Rose, it only reminds you fragrant and enticing aroma, some food decorative ingredient or a gift to a loved one. But you may be a surprise to know besides these perfumed or enticing aromas it can be the best herbal tea for weight loss. In Ayurveda rose is also terms as balakarika, bala means strength, it has properties that can nourish the stomach, intestine, and liver organ processes. In addition to that, it has deepana properties, which balance appetite and pachana that improve overall metabolism. The other reasons that it is caffeine free and is highly packed with antioxidant properties even more than the famous green tea. The Rose tea contains multiple vitamins such as A, B3, C, D, and E, which are known to fight against various infections. The other benefit is that it helps to remove toxins from the body which can beautify the skin making you look younger. Here’s a recipe to make rose tea for weight loss. How to Make Tea from Dried Rose Petals? Take 1 to 2 teaspoons of dried petals of a rose. Heat 1 cup of water in a vessel, put rose petals into it and allow tea for steep, for 2-3 minutes. Filter it, now add honey for taste and serve it. How to Make Tea from fresh Rose Petals? Take 2 cups of fresh petals of a rose. Remove the white portion that is the base of the petals (as it tastes bitter). Heat 3 cups of water in a vessel put rose petals in it. Let it step for 5 minutes, strain the tea. Add some sugar or honey for taste and serve. It is best to drink warm tea. Green tea is another drink, which if consumed can have multiple health benefits due to its nutrients properties in it. It is amazing healthy drinks which can also benefit in weight loss program. It is due to its properties like antioxidants, catechin EGCG, and other nutrients. These properties in it help to boost body metabolism as well as to activate the liver to break down fats substantially. The Catechins properties in green tea also function as hunger suppressants when used with caffeine. As a result, you feel fuller for a longer time and sometimes also reduce food appetites. Researchers believe that drinking three to five cups of green tea daily can help to cut body fat up to 20 percent. If consumed for a few months you may find good results along with lowering the risk of heart attack significantly. Here’s a green tea recipe that can help to reduce belly fat. Preparation of green tea is quite different than that of normal black tea. One must take care that tea leaves steeped in water must not be over 90°C; if so it may become bitter. So steep it in water that’s not too hot. • Green tea leaves or green tea pearls 1 teaspoon. • 1 cup of water. • 1 teaspoon honey for taste. Take one teaspoon of green tea leaves. Now, boil 1 cup of water in a stainless steel vessel. The temperature must be around 80°C to 85°C, so make sure does not start boiling. If starts boiling anyway just switch off the gas and let it cool for about 35-45 seconds. Now place the tea leaves in a strainer and put it in the cup or mug. Pour the hot water into the cup and let the tea steep for 3 minutes. Remove the sieve aside; add 1 teaspoon honey for taste. Mix the honey well allow tea to cool for a few seconds and enjoy your cup of green tea. Note: In step 6 you need to be very careful. The tea may become stronger if kept for a longer time. So check spoonful of tea every 30-45 seconds to find out if the flavor is right for you. It may sound interesting but cayenne pepper tea is also a healthy drink that has many health benefits. It is so due to its Capsaicin properties in pepper, which gives the peppers a hot taste and its nature which help to fight obesity. Consuming tea can help you in decreasing calorie intake, lowering blood fat levels and also helps in shrinking of fat tissue. It fights against the fats that are build-up in a body by triggering beneficial protein. The hot property of capsaicin acts as thermogenic, it thereby increase thermogenesis in your body. These thermal genesis impacts on metabolism and reduces a fat level stored in the body. Researchers do believe that consuming thermogenic properties can boost the body’s metabolism by up to 5%. This can increase the fat burning process by up to 16%. So this action can help to neutralize in metabolic rate that often occurs during weight loss. How to make cayenne pepper tea? Here’s a recipe to make detox tea for weight loss. Boil one cup of water in a steel vessel, remove the water from heat just before it reaches the boil. Take one teaspoon of cayenne pepper powder into a cup or mug. Add the hot water into it and stir the cayenne until it fully dissolved into the water. It may take some time to dissolve cayenne fully as it sometimes floats on the top, don’t worry about it. Now squeeze the fresh lemon into the cup and stir once again. Cover the cup with plate or saucer and allow it to steep for around five minutes. The drink is ready for serve; make sure you drink it before it cools down completely. Note: It is best to drink before breakfast, to stimulate the metabolism and reduce appetite. The other best time is to drink before bed; it helps the body to detoxify itself while you sleep. Dandelion is also known as Kanphool or Kukraundha in Hindi, it’s another weight loss tea with multiple health benefits. All the parts of the dandelion plant are edible and are loaded with nutrition value such as Vitamin A, C, phosphorous; Calcium, niacin, iron, magnesium, potassium, etc. Due to its multiple nutrition values with dietary fiber dandelions makes you feel full longer this ultimately helps you to maintain a healthy weight. The bitter taste of dandelions is due to its properties in it called Taraxacin; it is useful in dealing with constipation. If the processes of emptying the bowels are good the fats cannot be deposited within the body this helps in maintaining the weight. Here’s a recipe to make fresh ginger tea to burn belly fat. Now mix 2 tsp. of dandelion root powder in the boiling water. Reduce the heat and allow the tea to simmer for 30 seconds. Place the lid on the vessel and allow the tea to seep for five minutes. Now sieve the dandelion tea slowly into the mug. To Sweeten taste add honey or sugar to it. Turmeric tea is a healthy and digestive tea that improves emulsifying fat and its metabolism. Consuming Turmeric tea can be a great way to lose weight, which is due to its properties called Curcumin in it. The Curcumin is a property that makes turmeric a peculiar taste with its unique color. In a study of turmeric’s Curcumin active properties, it was found that it reduces the formation of fat tissue making blood vessels healthy. This activity can help to lower body fat and maintain a body weight gain. So the people fond of Indian curry! Its good news for them; you cannot only enjoy the taste to curry but also maintain your weight. Here’s a recipe to make turmeric tea to reduce tummy. Boil the water on a vessel. Add turmeric and ginger pastes. Strain the tea in a container. Add honey into it for taste. Ginger tea can also be added to the list of tea for weight loss. Ginger is a warming spice that has anti-inflammatory properties, which is known to help to soothe and relax intestinal tract. Ginger tea is also a popular home remedy that has been used for ages for a variety of ailments like gastritis, digestive disorders, upset of tummy, vomiting, etc. Research indicates that ginger has thermogenic properties that can boost the metabolism of the body and also have appetite-suppressant effect. Ginger tea if consumed regularly can be helpful in a weight-loss plan. How to make Ginger Tea with Fresh Ginger Root? Here’s a Ginger Tea recipe to reduce belly fat. Boil 250 ml water in a vessel. Now add grated ginger root into it and allow simmering for 5 minutes. Now sieve the tea and add honey if desired. Black pepper tea contains healthy fats along with dietary fiber that can help you in a weight-loss plan. It is beneficial, due to its properties called “piperine” in it which enhances metabolic performance and additionally blocks the formation of new fat cells throughout the body. Researchers believe that black pepper when combined with capsaicin if consumed regularly can burn calories that are equal to as taking a 20-minute walk. Besides this, it is also a superfood that has vitamins like A, K, C, along with minerals such as sodium, potassium, calcium, etc., which can also promote weight loss. How to make Black Pepper Tea? Here’s a recipe to make Black Pepper Tea For stomach fat. Boil 2 cups of water in a vessel. Now add 1 tsp of black pepper in it. Now sieve the tea and add lemon juice. Note: Adding more than 1tsp pepper can cause throat burning so take precautions. Pregnancy is a phase where women faces physical, physiological, emotional disturbances. Yoga helps to overcome those disturbances. And to have a beautiful phase of pregnancy.